Mark Page, 37, of Hatchetts Drive, Haslemere, was fined £200 and must pay £30 vixtim surcharge after admitting taking a vehicle without consent in East Street, Rogate, on January 6, 2018. He was fined £200 and must pay £85 costs after admitting driving without insurance in East Street, Rogate, on January 6, 2018. His driving record was endorsed with six points. William Tolland, 36, of London Road, Riverhead, was fined £54 and must pay £169.99 compensation, £30 victim surcharge, £85 costs, after admitting stealing two San Disk USB memory sticks and one Epson multi ink worth £199.98 in Chichester on November 30, 2017. 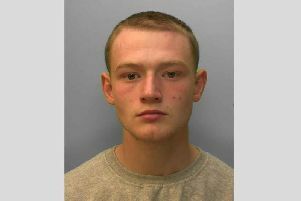 Robert Daly, 25, of Kestrel Court, Elizabeth Road, Chichester, was fined £300 and must pay £30 victim surcharge, £85 costs, after admitting possessing 15g of herbal cannabis in Chichester on February 18, 2018. Glenn Jones, 55, of Tutsham Way, Paddock Wood, Tonbridge, was fined £300 and must pay £30 victim surcharge, £85 costs, after admitting failing to comply with notification requirements as required under the Sexual Offences Act in Bersted between October 1, 2017, and October 31, 2017. Marc Clements, 43, of Woodfield Close, Tangmere, was given a community order with two-month curfew, electronically monitored, from 8pm to 7am, and Rehabilitation Activity Requirement after admitting handling stolen goods, a £7,000 Citreon Berlingo, in Chichester on July 21, 2017. He must pay £85 victim surcharge, £135 costs. He also admitted carrying a small lock knife in Elizabeth Road, Chichester, on July 21, 2017, no separate penalty. Charlie Craig-Cowen, 32, of Bridgewater Close, Billingshurst, was given a community order with Building Better Relationships programme requirement and Rehabilitation Activity Requirement after admitting two charges of assault by beating in Pulborough, one on February 4, 2018, and one on February 5, 2018. He was also given a restraining order and must pay £85 victim surcharge, £85 costs. James Wise, 42, of Hunston Road, Chichester, was given a 12-week prison sentence, suspended for 12 months, with Alcohol Treatment Requirement and Rehabilitation Activity Requirement after admitting drink-driving (168mg of alcohol in 100ml of breath) in West Parade, West Worthing, on February 4, 2018. He must pay £115 victim surcharge, £85 costs, and was disqualified from driving for 30 months. Peter Overnell, 33, c/o West Street, Bognor Regis, was fined £100 and must pay £65 costs, after admitting breaching a community order made by Worthing Magistrates Court on December 19, 2017. Lewis Jeffery, 33, of Loweswater Gardens, Bordon, was given a 24-week prison sentence, suspended for 18 months, and must carry out 200 hours’ unpaid work after admitting stealing a diamond engagement ring worth £1,100 in Midhurst on July 7, 2017. He must pay £200 compensation, £115 victim surcharge, £85 costs. Tracy Garrett, 47, of Canons Close, Aldwick, was fined £80 and must pay £30 victim surcharge, £85 costs, after admitting driving over 70mph on the A34 Winchester on May 27, 2017. Her driving record was endorsed with four points. Christopher Mann, 45, of Argyle Road, Bognor Regis, was fined £295 and must pay £30 victim surcharge, £85 costs, after admitting driving over the 60mph speed limit on the A27 West Ashling on July 17, 2017. His driving record was endorsed with five points. Denes Szaniszlo, 39, of Southdown Road, Bognor Regis, was fined £65 and must pay £30 victim surcharge, £30 costs, after admitting driving over the 50mph speed limit on the A1081 Luton on May 12, 2017. His driving record was endorsed with three points.